The United Nations Environment Programme (UNEP), an agency of the United Nations, coordinates the organization's environmental activities and assists developing countries in implementing environmentally sound policies and practices. 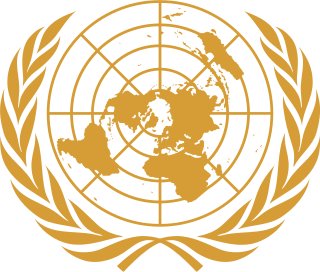 It was founded by Maurice Strong, its first director, as a result of the United Nations Conference on the Human Environment in June 1972 and has overall responsibility for environmental problems among United Nations agencies; however, international talks on specialized issues, such as addressing climate change or combating desertification, are overseen by other UN organizations, like the Bonn-based Secretariat of the United Nations Framework Convention on Climate Change and the United Nations Convention to Combat Desertification. UNEP's activities cover a wide range of issues regarding the atmosphere, marine and terrestrial ecosystems, environmental governance and green economy. It has played a significant role in developing international environmental conventions, promoting environmental science and information and illustrating the way those can be implemented in conjunction with policy, working on the development and implementation of policy with national governments, regional institutions in conjunction with environmental non-governmental organizations (NGOs). UNEP has also been active in funding and implementing environment related development projects. Photosynthetically active radiation, often abbreviated PAR, designates the spectral range of solar radiation from 400 to 700 nanometers that photosynthetic organisms are able to use in the process of photosynthesis. This spectral region corresponds more or less with the range of light visible to the human eye. Photons at shorter wavelengths tend to be so energetic that they can be damaging to cells and tissues, but are mostly filtered out by the ozone layer in the stratosphere. Photons at longer wavelengths do not carry enough energy to allow photosynthesis to take place. The most prevalent coral in the reefs Belize in 1998 was the lettuce coral, Agaricia tenuifolia . On 22 and 23 October, surveys were conducted at two sites and the findings were devastating. Virtually all the living coral was bleached white and their skeletons indicated that they had died recently. At the lagoon floor, complete bleaching was evident among A. tenuifolia. Furthermore, surveys done in 1999 and 2000 showed a near total mortality of A. tenuifolia at all depths. Similar patterns occurred in other coral species as well. Measurements on water turbidity suggest that these mortalities were attributed to rising water temperatures rather than solar radiation. The lemon damselfish ( Pomacentrus moluccensis ) is a coral associated species that has been shown to decline dramatically following coral bleaching. ↑ Dove SG, Hoegh-Guldberg O (2006). "Coral bleaching can be caused by stress. The cell physiology of coral bleaching". In Ove Hoegh-Guldberg, Jonathan T. Phinney, William Skirving, Joanie Kleypas. Coral Reefs and Climate Change: Science and Management. [Washington]: American Geophysical Union. pp. 1–18. ISBN 978-0-87590-359-0. 1 2 "The Great Barrier Reef: a catastrophe laid bare". The Guardian. 6 June 2016. ↑ "Coral bleaching on Great Barrier Reef worse than expected, surveys show". The Guardian . 29 May 2017. Retrieved 29 May 2017. ↑ "The United Nations just released a warning that the Great Barrier Reef is dying". The Independent. 3 June 2017. Retrieved 11 June 2017. ↑ Hughes TP, Kerry JT, Álvarez-Noriega M, Álvarez-Romero JG, Anderson KD, Baird AH, et al. (March 2017). "Global warming and recurrent mass bleaching of corals". Nature. 543 (7645): 373–377. Bibcode:2017Natur.543..373H. doi:10.1038/nature21707. PMID 28300113. ↑ "Mass coral bleaching hits the Great Barrier Reef for the second year in a row". USA TODAY. 13 March 2017. Retrieved 14 March 2017. ↑ Hughes TP, Anderson KD, Connolly SR, Heron SF, Kerry JT, Lough JM, et al. (January 2018). "Spatial and temporal patterns of mass bleaching of corals in the Anthropocene" (PDF). Science. 359 (6371): 80–83. Bibcode:2018Sci...359...80H. doi:10.1126/science.aan8048. PMID 29302011. 1 2 Hoegh-Guldberg, Ove (1999). "Climate change, coral bleaching and the future of the world's coral reefs". Marine and Freshwater Research. 50 (8): 839–66. doi:10.1071/MF99078. ↑ Nir O, Gruber DF, Shemesh E, Glasser E, Tchernov D (15 January 2014). "Seasonal mesophotic coral bleaching of Stylophora pistillata in the Northern Red Sea". PLOS One. 9 (1): e84968. Bibcode:2014PLoSO...984968N. doi:10.1371/journal.pone.0084968. PMC 3893136 . PMID 24454772. 1 2 Hoegh-Guldberg O, Mumby PJ, Hooten AJ, Steneck RS, Greenfield P, Gomez E, et al. (December 2007). "Coral reefs under rapid climate change and ocean acidification". Science. 318 (5857): 1737–42. Bibcode:2007Sci...318.1737H. CiteSeerX 10.1.1.702.1733 . doi:10.1126/science.1152509. PMID 18079392. ↑ Baker A, Glynn P, Riegl B (2008). "Climate change and coral reef bleaching: An ecological assessment of long-term impacts, recovery trends and future outlook". Estuarine, Coastal and Shelf Science . 80 (4): 435–471. Bibcode:2008ECSS...80..435B. doi:10.1016/j.ecss.2008.09.003. ↑ "Reef 'at risk in climate change'" (Press release). The University of Queensland. 6 April 2007. Retrieved 2 August 2016. ↑ Saxby T, Dennison WC, Hoegh-Guldberg O (2003). "Photosynthetic responses of the coral Montipora digitata to cold temperature stress". Marine Ecology Progress Series. 248: 85–97. Bibcode:2003MEPS..248...85S. doi:10.3354/meps248085. ↑ Marimuthu N, Jerald Wilson J, Vinithkumar NV, Kirubagaran R (9 November 2012). "Coral reef recovery status in south Andaman Islands after the bleaching event 2010". Journal of Ocean University of China. 12 (1): 91–96. Bibcode:2013JOUC...12...91M. doi:10.1007/s11802-013-2014-2. ↑ "Mass Coral Bleaching". fisherycrisis.com. ↑ Rogers CS (1990). "Responses of coral reefs and reef organisms to sedimentation". Marine Ecology Progress Series. 62: 185–202. Bibcode:1990MEPS...62..185R. doi:10.3354/meps062185. ↑ Kushmaro A, Rosenberg E, Fine M, Loya Y (1997). "Bleaching of the coral Oculina patagonica by Vibrio AK-1". Marine Ecology Progress Series. 147: 159–65. Bibcode:1997MEPS..147..159K. doi:10.3354/meps147159. ↑ Hoegh-Guldberg O, Smith G (1989). "The effect of sudden changes in temperature, light and salinity on the population density and export of zooxanthellae from the reef corals Stylophora pistillata Esper and Seriatopora hystrix Dana". Journal of Experimental Marine Biology and Ecology. 129 (3): 279–303. doi:10.1016/0022-0981(89)90109-3. ↑ Jones RJ, Muller J, Haynes D, Schreiber U (2003). "Effects of herbicides diuron and atrazine on corals of the Great Barrier Reef, Australia". Marine Ecology Progress Series. 251: 153–167. Bibcode:2003MEPS..251..153J. doi:10.3354/meps251153. ↑ Anthony KR, Kerswell AP (2007). "Coral mortality following extreme low tides and high solar radiation". Marine Biology. 151 (5): 1623–31. doi:10.1007/s00227-006-0573-0. ↑ Jones RJ, Hoegh-Guldberg O (1999). "Effects of cyanide on coral photosynthesis:implications for identifying the cause of coral bleaching and for assessing the environmental effects of cyanide fishing". Marine Ecology Progress Series. 177: 83–91. Bibcode:1999MEPS..177...83J. doi:10.3354/meps177083. ↑ U. S. Geological Survey. Coral Mortality and African Dust. Retrieved on 10 June 2007. ↑ "Protect Yourself, Protect The Reef! The impacts of sunscreens on our coral reefs" (PDF). U.S. National Park Service. Retrieved 1 July 2013. ↑ Than, Ker. "Swimmers' Sunscreen Killing Off Coral". National Geographic News. National Geographic News. Retrieved 29 January 2008. ↑ "Coral Reef Safe Sunscreen". badgerbalm.com. ↑ Danovaro R, Bongiorni L, Corinaldesi C, Giovannelli D, Damiani E, Astolfi P, Greci L, Pusceddu A (April 2008). "Sunscreens cause coral bleaching by promoting viral infections". Environmental Health Perspectives. 116 (4): 441–7. doi:10.1289/ehp.10966. PMC 2291018 . PMID 18414624. ↑ Downs CA, Kramarsky-Winter E, Fauth JE, Segal R, Bronstein O, Jeger R, Lichtenfeld Y, Woodley CM, Pennington P, Kushmaro A, Loya Y (March 2014). "Toxicological effects of the sunscreen UV filter, benzophenone-2, on planulae and in vitro cells of the coral, Stylophora pistillata". Ecotoxicology. 23 (2): 175–91. doi:10.1007/s10646-013-1161-y. PMID 24352829. ↑ Anthony KR, Kline DI, Diaz-Pulido G, Dove S, Hoegh-Guldberg O (November 2008). "Ocean acidification causes bleaching and productivity loss in coral reef builders". Proceedings of the National Academy of Sciences of the United States of America. 105 (45): 17442–6. Bibcode:2008PNAS..10517442A. doi:10.1073/pnas.0804478105. PMC 2580748 . PMID 18988740. 1 2 3 4 5 "How Do Oil Spills Affect Coral Reefs?". response.restoration.noaa.gov. Retrieved 24 April 2018. ↑ Baker AC, Glynn PW, Riegl B (2008). "Climate change and coral reef bleaching: An ecological assessment of long-term impacts, recovery trends and future outlook". Estuarine, Coastal and Shelf Science. 80 (4): 435–71. Bibcode:2008ECSS...80..435B. doi:10.1016/j.ecss.2008.09.003. ↑ Chumkiew S, Jaroensutasinee M, Jaroensutasinee K (2011). "Impact of Global Warming on Coral Reefs". Walailak Journal of Science and Technology. 8 (2): 111–29. ↑ Huppert A, Stone L (September 1998). "Chaos in the Pacific's coral reef bleaching cycle". The American Naturalist. 152 (3): 447–59. doi:10.1086/286181. PMID 18811451. ↑ McDermott, Amy (22 June 2016). "Coral bleaching event is longest on record". Science News . Retrieved 25 July 2016. 1 2 3 4 5 6 7 8 9 10 11 12 13 14 Albright R (December 2017). "Can We Save the Corals?". Scientific American. 318 (1): 42–49. Bibcode:2017SciAm.318a..42A. doi:10.1038/scientificamerican0118-42. PMID 29257818. 1 2 Marshall P, Schuttenberg H (2006). A Reef Manager's Guide to Coral Bleaching (PDF). Townsville, Australia: Great Barrier Reef Marine Park Authority. pp. 78–79. ISBN 978-1-876945-40-4. ↑ Iguchi A, Ozaki S, Nakamura T, Inoue M, Tanaka Y, Suzuki A, Kawahata H, Sakai K (February 2012). "Effects of acidified seawater on coral calcification and symbiotic algae on the massive coral Porites australiensis". Marine Environmental Research. 73: 32–6. doi:10.1016/j.marenvres.2011.10.008. PMID 22115919. ↑ Zapalski MK, Nowicki J, Jakubowicz M, Berkowski B (2017). "Tabulate corals across the Frasnian/Famennian boundary: architectural turnover and its possible relation to ancient photosymbiosis". Palaeogeography, Palaeoclimatology, Palaeoecology. 487: 416–429. Bibcode:2017PPP...487..416Z. doi:10.1016/j.palaeo.2017.09.028. ↑ IPCC (2007). "Summary for policymakers" (PDF). In Parry ML, Canziani OF, Palutikof JP, van der Linden PJ, Hanson CE. Climate Change 2007: impacts, adaptation and vulnerability: contribution of Working Group II to the fourth assessment report of the Intergovernmental Panel on Climate Change. Cambridge, UK: Cambridge University Press. pp. 7–22. ISBN 978-0-521-70597-4. ↑ Fischlin A, Midgley GF, Price JT, Leemans R, Gopal B, Turley C, Rounsevell MD, Dube OP, Tarazona J, Velichko AA (2007). "Ch 4. Ecosystems, their properties, goods and services" (PDF). In Parry ML, Canziani OF, Palutikof JP, van der Linden PJ, Hanson CE. Climate Change 2007: impacts, adaptation and vulnerability: contribution of Working Group II to the fourth assessment report of the Intergovernmental Panel on Climate Change. Cambridge, UK: Cambridge University Press. pp. 211–72. ISBN 978-0-521-70597-4. ↑ Nicholls RJ, Wong PP, Burkett V, Codignotto J, Hay J, McLean R, Ragoonaden S, Woodroffe CD (2007). "Ch 6. Coastal systems and low-lying areas" (PDF). In Parry ML, Canziani OF, Palutikof JP, van der Linden PJ, Hanson CE. Climate Change 2007: impacts, adaptation and vulnerability: contribution of Working Group II to the fourth assessment report of the Intergovernmental Panel on Climate Change. Cambridge, UK: Cambridge University Press. pp. 315–57. ISBN 978-0-521-70597-4. 1 2 Hennessy K, Fitzharris B, Bates BC, Harvey N, Howden M, Hughes L, Salinger J, Warrick R (2007). "Ch 11. Australia and New Zealand" (PDF). In Parry ML, Canziani OF, Palutikof JP, van der Linden PJ, Hanson CE. Climate Change 2007: impacts, adaptation and vulnerability: contribution of Working Group II to the fourth assessment report of the Intergovernmental Panel on Climate Change. Cambridge, UK: Cambridge University Press. pp. 507–40. ISBN 978-0-521-70597-4. ↑ Plumer, Brad (31 March 2016). "The unprecedented coral bleaching disaster at the Great Barrier Reef, explained". Vox Energy & Environment. ↑ Johnson JE, Marshall PA (2007). Climate change and the Great Barrier Reef: a vulnerability assessment. Townsville, Qld. : Great Barrier Reef Marine Park Authority. ISBN 978-1-876945-61-9. Archived from the original on 25 January 2014. 1 2 Done T, Whetton P, Jones R, Berkelmans R, Lough J, Skirving W, Wooldridge S (2003). Global Climate Change and Coral Bleaching on the Great Barrier Reef (PDF). Queensland Government Department of Natural Resources and Mines. ISBN 978-0-642-32220-3. Archived from the original (PDF) on 27 September 2011. ↑ Berkelmans R, De'ath G, Kininmonth S, Skirving WJ (2004). "A comparison of the 1998 and 2002 coral bleaching events on the Great Barrier Reef: spatial correlation, patterns, and predictions". Coral Reefs. 23 (1): 74–83. doi:10.1007/s00338-003-0353-y. ↑ Osborne K, Dolman AM, Burgess SC, Johns KA (March 2011). "Disturbance and the dynamics of coral cover on the Great Barrier Reef (1995–2009)". PLOS One. 6 (3): e17516. Bibcode:2011PLoSO...617516O. doi:10.1371/journal.pone.0017516. PMC 3053361 . PMID 21423742. ↑ De'ath G, Fabricius KE, Sweatman H, Puotinen M (October 2012). "The 27-year decline of coral cover on the Great Barrier Reef and its causes". Proceedings of the National Academy of Sciences of the United States of America. 109 (44): 17995–9. Bibcode:2012PNAS..10917995D. doi:10.1073/pnas.1208909109. PMC 3497744 . PMID 23027961. ↑ Final Report: 2016 Coral Bleaching Event on Great Barrier Reef . Great Barrier Reef Marine Park Authority Townsville, 2017, pp. 24–24, Final Report: 2016 Coral Bleaching Event on Great Barrier Reef . ↑ IPCC (2007). "Summary for policymakers" (PDF). In Solomon S, Qin D, Manning M, Chen Z, Marquis M, Averyt KB, Tignor M, Miller HL. Climate change 2007: The Physical Science Basis. Contribution of Working Group I to the Fourth Assessment Report of the Intergovernmental Panel on Climate Change. Cambridge, UK: Cambridge University Press. pp. 1–18. ↑ Hokiel, Paul J. "Climate Change and Hawaii's Coral Reefs" (PDF). Hawaii Coral Reef Monitoring and Assessment Program. US Fish and Wildlife Service. ↑ "Rapidly warming ocean a threat to Hawaiian coral reefs". The University of Queensland. 2015. ↑ "Corals in peril at a popular Hawaiian tourist destination due to global climate change" . Retrieved 30 May 2017. ↑ Kahn, Brian (November 8, 2017). "Coral Bleaching Has Ravaged Half of Hawaii's Coral Reefs". Gizmodo. ↑ "Hawaii coral reefs stabilizing following bleaching event". Associated Press. January 24, 2019. Retrieved January 25, 2019. ↑ Barkley, Hannah C.; Cohen, Anne L.; Mollica, Nathaniel R.; Brainard, Russell E.; Rivera, Hanny E.; DeCarlo, Thomas M.; Lohmann, George P.; Drenkard, Elizabeth J.; Alpert, Alice E. (2018-11-08). "Repeat bleaching of a central Pacific coral reef over the past six decades (1960–2016)". Communications Biology. 1 (1): 177. doi:10.1038/s42003-018-0183-7. hdl:1912/10707. ISSN 2399-3642. PMC 6224388 . PMID 30417118. ↑ McCurry, Justin (11 January 2017). "Almost 75% of Japan's biggest coral reef has died from bleaching, says report". The Guardian. Retrieved 30 May 2017. ↑ "More than 60% of Maldives' coral reefs hit by bleaching". The Guardian. 8 August 2016. Retrieved 31 May 2017. ↑ "As sea temperatures rise, Thailand sees coral bleeching". Bangkok Post. 25 December 2016. ↑ Fleshler, David (24 April 2016). "South Florida corals dying in "unprecedented" bleaching and disease". Sun-Sentinel.com. ↑ Smith JE, Brainard R, Carter A, Grillo S, Edwards C, Harris J, Lewis L, Obura D, Rohwer F, Sala E, Vroom PS, Sandin S (January 2016). "Re-evaluating the health of coral reef communities: baselines and evidence for human impacts across the central Pacific". Proceedings. Biological Sciences. 283 (1822): 20151985. doi:10.1098/rspb.2015.1985. PMC 4721084 . PMID 26740615. ↑ Buglass S, Donner SD, Alemu I JB (March 2016). "A study on the recovery of Tobago's coral reefs following the 2010 mass bleaching event". Marine Pollution Bulletin. 104 (1–2): 198–206. doi:10.1016/j.marpolbul.2016.01.038. PMID 26856646. ↑ Alevizon, William. "Red Sea Coral Reefs". Coral Reef Facts. Retrieved 27 February 2014. ↑ Riegl BM, Bruckner AW, Rowlands GP, Purkis SJ, Renaud P (31 May 2012). "Red Sea coral reef trajectories over 2 decades suggest increasing community homogenization and decline in coral size". PLOS One. 7 (5): e38396. Bibcode:2012PLoSO...738396R. doi:10.1371/journal.pone.0038396. PMC 3365012 . PMID 22693620. ↑ Furby KA, Bouwmeester J, Berumen ML (4 January 2013). "Susceptibility of central Red Sea corals during a major bleaching event". Coral Reefs. 32 (2): 505–513. Bibcode:2013CorRe..32..505F. doi:10.1007/s00338-012-0998-5. 1 2 3 4 5 Speers AE, Besedin EY, Palardy JE, Moore C (1 August 2016). "Impacts of climate change and ocean acidification on coral reef fisheries: An integrated ecological–economic model". Ecological Economics. 128: 33–43. doi:10.1016/j.ecolecon.2016.04.012. 1 2 3 Chen P, Chen C, Chu L, McCarl B (1 January 2015). "Evaluating the economic damage of climate change on global coral reefs". Global Environmental Change. 30: 12–20. doi:10.1016/j.gloenvcha.2014.10.011. 1 2 3 Teh LS, Teh LC, Sumaila UR (19 June 2013). "A Global Estimate of the Number of Coral Reef Fishers". PLOS One. 8 (6): e65397. Bibcode:2013PLoSO...865397T. doi:10.1371/journal.pone.0065397. PMC 3686796 . PMID 23840327. 1 2 Wolff NH, Donner SD, Cao L, Iglesias-Prieto R, Sale PF, Mumby PJ (November 2015). "Global inequities between polluters and the polluted: climate change impacts on coral reefs". Global Change Biology. 21 (11): 3982–94. Bibcode:2015GCBio..21.3982W. doi:10.1111/gcb.13015. PMID 26234736. 1 2 Liu G, Strong AE, Skirving W (15 April 2003). "Remote sensing of sea surface temperatures during 2002 Barrier Reef coral bleaching". Eos, Transactions American Geophysical Union. 84 (15): 137–141. Bibcode:2003EOSTr..84..137L. doi:10.1029/2003EO150001. ↑ McClanahan TR, Ateweberhan M, Sebastián CR, Graham NJ, Wilson SK, Bruggemann JH, Guillaume MM (1 September 2007). "Predictability of coral bleaching from synoptic satellite and in situ temperature observations". Coral Reefs. 26 (3): 695–701. doi:10.1007/s00338-006-0193-7. 1 2 Liu, Gang & Strong, Alan & Skirving, William & Arzayus, Felipe. (2005). Overview of NOAA coral reef watch program's near-real time satellite global coral bleaching monitoring activities. Proc 10th Int Coral Reef Symp. 1. pp. 1783–1793. ↑ "Pro-opinion of NOAA Hotspots". ↑ NOAA Coral Reef Watch. "Methodology, Product Description, and Data Availability of Coral Reef Watch Operational and Experimental Satellite Coral Bleaching Monitoring Products". NOAA. Retrieved 27 February 2014. 1 2 Maynard JA, Johnson JE, Marshall PA, Eakin CM, Goby G, Schuttenberg H, Spillman CM (July 2009). "A strategic framework for responding to coral bleaching events in a changing climate". Environmental Management. 44 (1): 1–11. Bibcode:2009EnMan..44....1M. doi:10.1007/s00267-009-9295-7. PMID 19434447. 1 2 Lang, Susan (13 December 2007). "Major international study warns global warming is destroying coral reefs and calls for 'drastic actions'". Cornell Chronicle. Retrieved 8 August 2011. ↑ Manzello DP, Eakin CM, Glynn PW (2017). Coral Reefs of the Eastern Tropical Pacific. Coral Reefs of the World. Springer, Dordrecht. pp. 517–533. doi:10.1007/978-94-017-7499-4_18. ISBN 9789401774987. ↑ Anthony KR, Maynard JA, Diaz-Pulido G, Mumby PJ, Marshall PA, Cao L, Hoegh-Guldberg O (1 May 2011). "Ocean acidification and warming will lower coral reef resilience". Global Change Biology. 17 (5): 1798–1808. Bibcode:2011GCBio..17.1798A. doi:10.1111/j.1365-2486.2010.02364.x. PMC 3597261 . ↑ Kushmaro A, Loya Y, Fine M, Rosenberg E (1996). "Bacterial infection and coral bleaching". Nature. 380 (6573): 396. Bibcode:1996Natur.380..396K. doi:10.1038/380396a0. 1 2 Rosenberg E, Ben-Haim Y (June 2002). "Microbial diseases of corals and global warming". Environmental Microbiology. 4 (6): 318–26. doi:10.1046/j.1462-2920.2002.00302.x. PMID 12071977. ↑ Sheridan C, Kramarsky-Winter E, Sweet M, Kushmaro A, Leal MC (2013). "Diseases in coral aquaculture: causes, implications and preventions". Aquaculture. 396: 124–135. doi:10.1016/j.aquaculture.2013.02.037. ↑ Sutherland KP, Porter J, Torres C (2004). "Disease and Immunity in Caribbean and Indo-pacific Zooxanthellate Corals". Marine Ecology Progress Series. 266: 273–302. Bibcode:2004MEPS..266..273S. doi:10.3354/meps266273. ↑ Reshef L, Koren O, Loya Y, Zilber-Rosenberg I, Rosenberg E (December 2006). "The coral probiotic hypothesis". Environmental Microbiology. 8 (12): 2068–73. CiteSeerX 10.1.1.627.6120 . doi:10.1111/j.1462-2920.2006.01148.x. PMID 17107548. ↑ LaJeunesse, Todd. "Diversity of Corals, Algae in Warm Indian Ocean Suggests Resilience to Future Global Warming". Penn State Science. Retrieved 27 February 2014. ↑ LaJeunesse TC, Smith R, Walther M, Pinzón J, Pettay DT, McGinley M, Aschaffenburg M, Medina-Rosas P, Cupul-Magaña AL, Pérez AL, Reyes-Bonilla H, Warner ME (October 2010). "Host-symbiont recombination versus natural selection in the response of coral-dinoflagellate symbioses to environmental disturbance". Proceedings. Biological Sciences. 277 (1696): 2925–34. doi:10.1098/rspb.2010.0385. PMC 2982020 . PMID 20444713. ↑ Climatewire, Lauren Morello. "Can Corals Adapt to Climate Change and Ocean Acidification?". Scientific American. 1 2 3 4 5 6 7 8 Ateweberhan M, Feary DA, Keshavmurthy S, Chen A, Schleyer MH, Sheppard CR (September 2013). "Climate change impacts on coral reefs: synergies with local effects, possibilities for acclimation, and management implications". Marine Pollution Bulletin. 74 (2): 526–39. doi:10.1016/j.marpolbul.2013.06.011. PMID 23816307. 1 2 3 4 5 6 Graham NA, Jennings S, MacNeil MA, Mouillot D, Wilson SK (February 2015). "Predicting climate-driven regime shifts versus rebound potential in coral reefs". Nature. 518 (7537): 94–7. Bibcode:2015Natur.518...94G. doi:10.1038/nature14140. PMID 25607371. 1 2 Folke C, Carpenter S, Walker B, Scheffer M, Elmqvist T, Gunderson L, Holling C (2004). "Regime Shifts, Resilience, and Biodiversity in Ecosystem Management". Annual Review of Ecology, Evolution, and Systematics. 35 (1): 557–81. CiteSeerX 10.1.1.489.8717 . doi:10.1146/annurev.ecolsys.35.021103.105711. JSTOR 30034127. 1 2 3 Baker AC, Glynn PW, Riegl B (10 December 2008). "Climate change and coral reef bleaching: An ecological assessment of long-term impacts, recovery trends and future outlook". Estuarine, Coastal and Shelf Science. 80 (4): 435–471. Bibcode:2008ECSS...80..435B. doi:10.1016/j.ecss.2008.09.003. 1 2 Hughes TP, Graham NA, Jackson JB, Mumby PJ, Steneck RS (November 2010). "Rising to the challenge of sustaining coral reef resilience". Trends in Ecology & Evolution. 25 (11): 633–42. doi:10.1016/j.tree.2010.07.011. PMID 20800316. ↑ Bellwood DR, Hoey AS, Ackerman JL, Depczynski M (2006). "Coral bleaching, reef fish community phase shifts and the resilience of coral reefs". Global Change Biology. 12 (9): 1587–94. Bibcode:2006GCBio..12.1587B. doi:10.1111/j.1365-2486.2006.01204.x. 1 2 3 4 Bellwood DR, Hughes TP, Folke C, Nyström M (June 2004). "Confronting the coral reef crisis". Nature. 429 (6994): 827–33. Bibcode:2004Natur.429..827B. doi:10.1038/nature02691. PMID 15215854. ↑ "New DNA study suggests coral reef biodiversity is seriously underestimated". Smithsonian Insider. 2 November 2011. ↑ "What are coral reef services worth? $130,000 to $1.2 million per hectare, per year: experts". EurekAlert!. American Association for the Advancement of Science (AAAS). 16 October 2009. ↑ Economic valuation and policy priorities for sustainable management of coral reefs. Sweden: World Fish Center. c. 2004. OCLC 56538155. 1 2 Markandya A (21 October 2014). "Benefits and Costs of the Biodiversity Targets for the Post-2015 Development Agenda" (PDF). Copenhagen Consensus Center. Southeast Asian coral reefs have the highest levels of biodiversity for the world's marine ecosystems. They serve many functions, such as forming the livelihood for subsistence fishermen and even function as jewelry and construction materials. Coral reefs are developed by the carbonate-based skeletons of a variety of animals and algae. Slowly and overtime, the reefs build up to the surface in oceans. Coral reefs are found in shallow, warm salt water. The sunlight filters through clear water and allows microscopic organisms to live and reproduce. The Indian Ocean holds 60% of the world's coastal reefs, 25% are in the Pacific and 15% are in the western Atlantic. There are coral reefs in the Persian Gulf, Madagascar, the Philippines, Hawaiian Islands and off Southeast Asia. Coral reefs have been preserved and identified in rocks over 400 million years old. Coral reefs are actually composed of tiny, fragile animals known as coral polyps. Coral reefs are significantly important because of the biodiversity. Although the number of fish are decreasing, the remaining coral reefs contain more unique sea creatures. The variety of species living on a coral reef is greater than anywhere else in the world. An estimation of 70-90% of fish caught are dependent on coral reefs in Southeast Asia and reefs support over 25% of all known marine species. However, those sensitive coral reefs are facing detrimental effects on them due to variety of factors: overfishing, sedimentation and pollution, bleaching, and even tourist-related damage. White band disease is a coral disease that affects acroporid corals and is distinguishable by the white band of dead coral tissue that it forms. The disease completely destroys the coral tissue of Caribbean acroporid corals, specifically elkhorn coral and staghorn coral. The disease exhibits a pronounced division between the remaining coral tissue and the exposed coral skeleton. These symptoms are similar to white plague, except that white band disease is only found on acroporid corals, and white plague has not been found on any acroporid corals. It is part of a class of similar disease known as "white syndromes", many of which may be linked to species of Vibrio bacteria. While the pathogen for this disease has not been identified, Vibrio carchariae may be one of its factors. The degradation of coral tissue usually begins at the base of the coral, working its way up to the branch tips, but it can begin in the middle of a branch. The Great Barrier Reef, the world's largest reef system, stretching along the East coast of Australia from the northern tip down to the town of Bundaberg, is composed of roughly 2,900 individual reefs and 940 islands and cays that stretch for 2,300 kilometres (1,616 mi) and cover an area of approximately 344,400 square kilometres (133,000 sq mi). The reef is located in the Coral Sea, off the coast of Queensland in northeast Australia. A large part of the reef is protected by the Great Barrier Reef Marine Park. Symbiodinium is a genus that encompasses the largest and most prevalent group of endosymbiotic dinoflagellates known. These unicellular algae commonly reside in the endoderm of tropical cnidarians such as corals, sea anemones, and jellyfish, where the products of their photosynthetic processing are exchanged in the host for inorganic molecules. They are also harbored by various species of sponge, flatworms, mollusks such as the giant clams, foraminifera (soritids), and some ciliates. Generally, these dinoflagellates enter the host cell through phagocytosis, persist as intracellular symbionts, reproduce, and disperse to the environment. The exception is in most mollusks, where Symbiodinium are intercellular. Cnidarians that are associated with Symbiodinium occur mostly in warm oligotrophic (nutrient-poor), marine environments where they are often the dominant constituents of benthic communities. These dinoflagellates are therefore among the most abundant eukaryotic microbes found in coral reef ecosystems. Ove Hoegh-Guldberg, is the inaugural Director of the Global Change Institute at the University of Queensland, and the holder of a Queensland Smart State Premier fellowship (2008–2013). He studies climate change and coral reefs. Hoegh-Guldberg has appeared on television, including two Australian Story series profiling his life and work, and radio, and maintains a blog on coral reefs, politics and the environment. The Coral Triangle is a geographical term so named as it refers to a roughly triangular area of the tropical marine waters of Indonesia, Malaysia, Papua New Guinea, Philippines, Solomon Islands and Timor-Leste that contain at least 500 species of reef-building corals in each ecoregion. This region encompasses portions of two biogeographic regions: the Indonesian-Philippines Region, and the Far Southwestern Pacific Region. The Coral Triangle is recognized as the global centre of marine biodiversity and a global priority for conservation. It is also called the "Amazon of the seas" and covers 5.7 million square kilometres (2,200,000 sq mi) of ocean waters. Its biological resources sustain the lives of over 120 million people. According to the Coral Triangle Knowledge Network, about $3 billion in fisheries exports and another $3 billion in coastal tourism revenues are derived as annual foreign exchange income in the region. Rising ocean temperatures and ocean acidification are radically altering aquatic ecosystems. Climate change is modifying fish distribution and the productivity of marine and freshwater species. This has impacts on the sustainability of fisheries and aquaculture, on the livelihoods of the communities that depend on fisheries, and on the ability of the oceans to capture and store carbon. The effect of sea level rise means that coastal fishing communities are in the front line of climate change, while changing rainfall patterns and water use impact on inland (freshwater) fisheries and aquaculture. The full relationship between fisheries and climate change is difficult to explore due to the context of each fishery and the many pathways that climate change affects. Symbiodinium trenchi is an endosymbiotic dinoflagellate, a unicellular alga which commonly resides in the tissues of tropical corals. It has a greater tolerance to fluctuations in water temperatures than do other species in the genus. It was named for the marine biologist R. K. Trench. Anthony W D Larkum is a plant scientist and academic based in Sydney. He is Professor Emeritus of Plant Sciences at the University of Sydney and Adjunct Professor at the University of Technology Sydney (UTS). Watson ME (2011). "Coral Reefs". In Allin CW. Encyclopedia of environmental issues. 1. Pasadena, Calif.: Salem Press. pp. 317–318. ISBN 978-1-58765-735-1. Wikimedia Commons has media related to Coral bleaching .